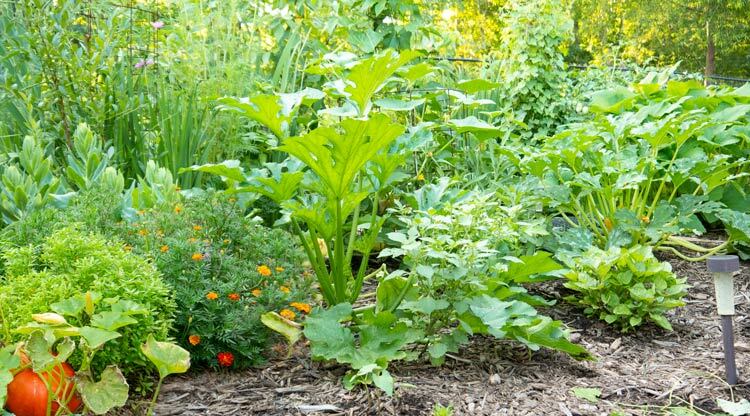 These 17 tips will help keep your ducks and chickens safe from predators in your back yard. Coyotes, bobcats, stray dogs, cats, hawks, snakes, skunks, raccoons, possums, ferrets… there is a long list of potential predators that would happily make a meal of your backyard ducks or chickens — or their eggs. A possum we accidentally caught in a trap intended for a groundhog. Possums can hiss and look scary, but they’re typically not duck predators (although they can be if given the opportunity). They will happily eat duck eggs. The most common urban predators of ducks and chickens are raccoons and hawks. “But I live in the city, so I don’t have predators.” Wrong. If anything, you probably have MORE raccoons and possums in your urban neighborhood than someone living in a rural setting. So how can you keep your ducks or chickens safe from potential predators while still making sure your poultry have a happy, high quality, outdoor life? Our girls are egg producers. We know that getting healthy eggs for us, means we have to provide conditions necessary for healthy ducks. That’s not just our opinion, that’s based on research data. Some of our Welsh Harlequin ducks out enjoying a good evening forage in the gardens. But a healthy duck can still easily become a victim of a hungry predator. That’s one reason why wild ducks have an average lifespan of 3-5 years, whereas domesticated ducks cared for by humans can live well into their teens. Jackson, one of our pampered Welsh Harlequin ducks who sleeps inside with us at night. Out of water, ducks instinctively sleep under bushes or other objects that make them less prone to being attacked by an aerial predator like a hawk or eagle. 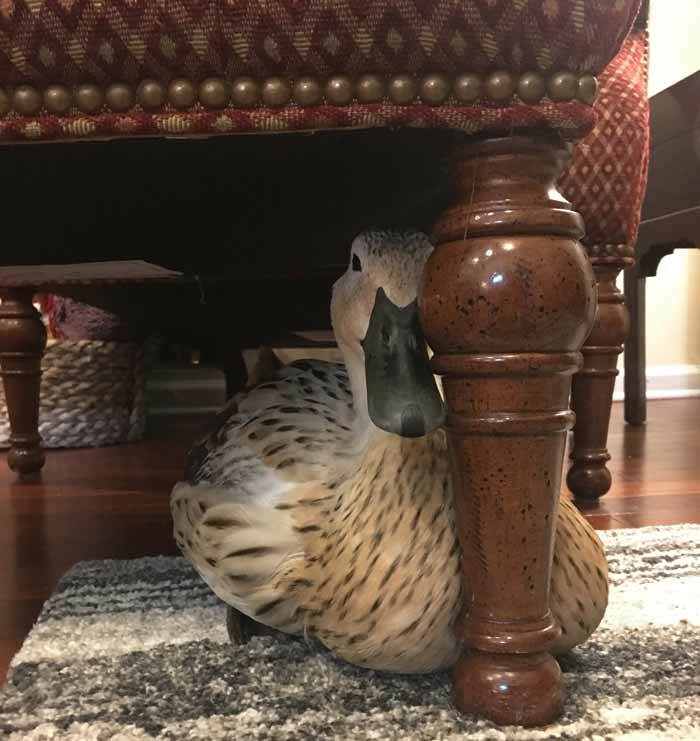 Inside our house, our ducks still adhere to this instinct by sleeping under chairs, tables, etc. How do you raise healthy ducks or chickens? full days outdoors foraging and basking in the sun. 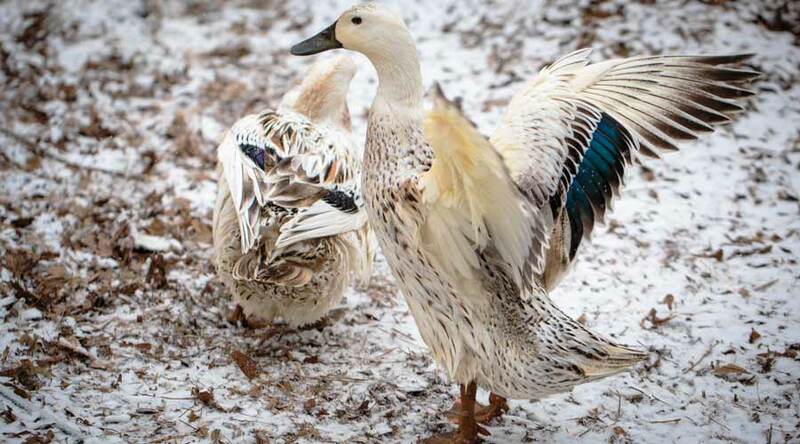 We’ve got those bases covered, but how do we keep our healthy ducks safe from predators? 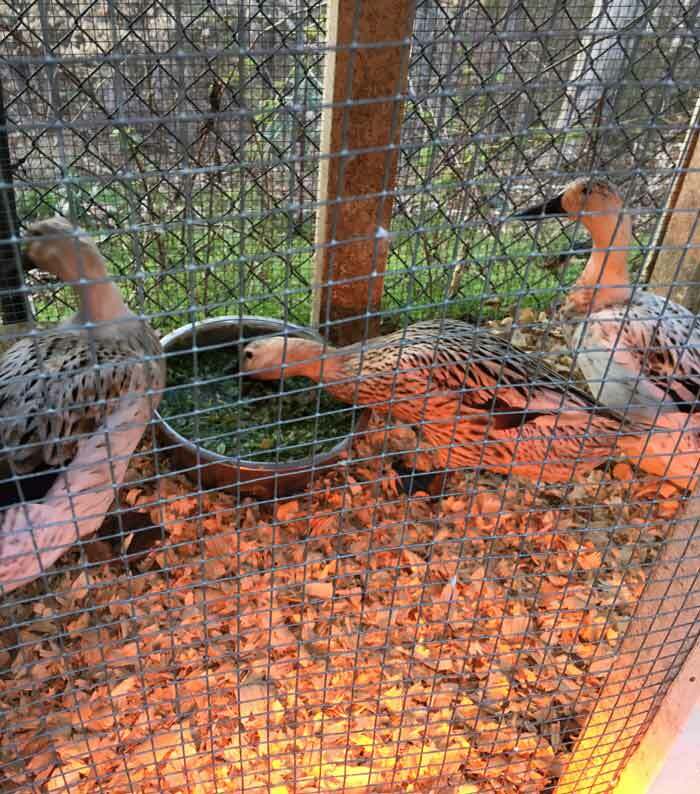 As much as The Tyrant loves spending evenings snuggling and giving bill pets to her two ducks that come inside at night, this isn’t how we keep our flock of Welsh Harlequin ducks safe from predators. You could have the healthiest outdoor chickens or ducks in the word, but if a fox kills them, that doesn’t do you or your previously healthy poultry much good. Conversely, you could keep your poultry 100% safe from predators by keeping them caged up all day, but that reduces their happiness and healthiness. A ship is safe in harbor, but that’s not what it’s meant for. 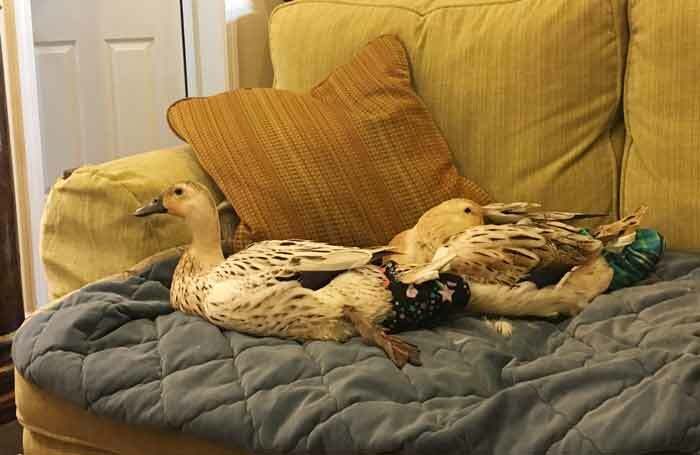 Our ducks are safe on our couch or caged up all day, but that’s not what they’re meant for. Sorry, skunky! 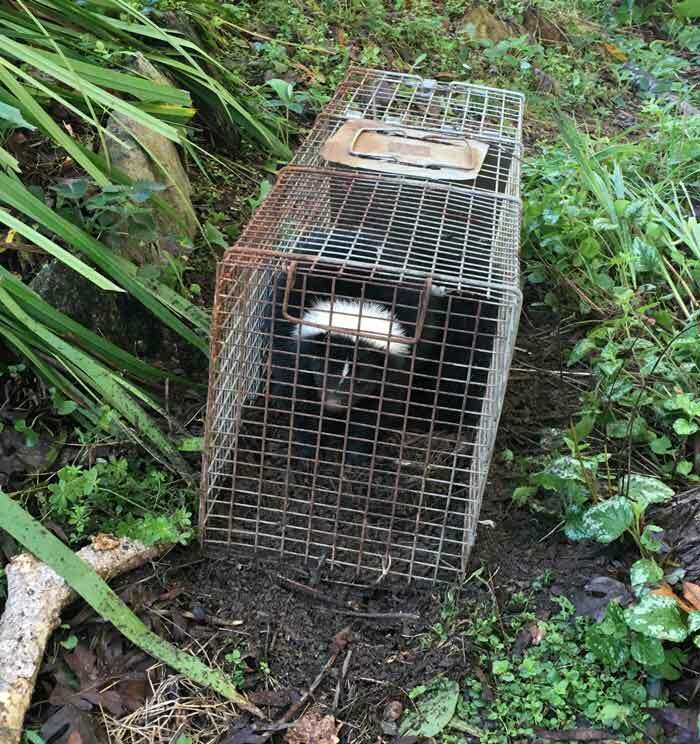 We accidentally left a groundhog trap open one night and caught one of our resident skunks. If you ever have a dog or cat get sprayed by a skunk (it’s Bob the cat’s favorite pastime) here’s how to get skunk spray smell off of your pet. Over the years, we’ve learned a thing or two (or seventeen) about how to keep backyard poultry safe while still providing them a great life. What’s the secret? Unfortunately, there’s no single, silver bullet solution. Instead, think of our 17 recommended poultry safety measures as a checklist of precautions you can take. With each recommendation you check off the list, you further reduce the statistical likelihood that a predator will injure or kill your backyard ducks or chickens. 1. Install 6′ tall perimeter fencing. We have 6′ tall perimeter fencing around our backyard where our duck spends their day. Two sides are wood fencing with the back side protected by chainlink. A large dog or coyote could potentially jump over a shorter fence, but 6′ keeps any daytime-hunting mammalian predators out of our yard. 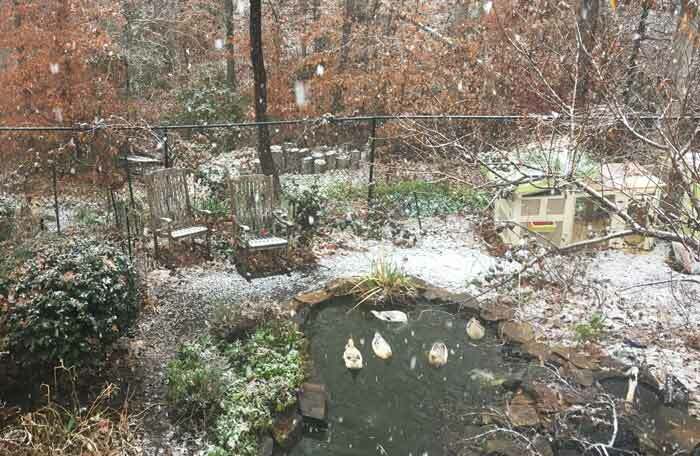 Here you can better see the 6′ chainlink fence along our back yard duck enclosure as snow starts to fall in late fall. 6′ wood fencing also extends along both sides of the yard, helping to predator-proof our ducks’ living area. 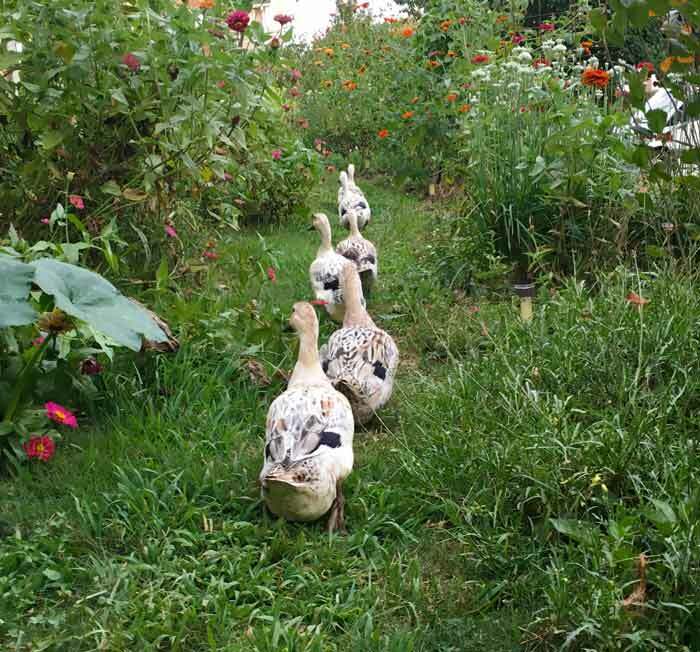 In the evening, we let our ducks out with us to forage while we do yard chores and harvest food for dinner. Since the rest of our yard is unfenced, one of us is always with our ducks just in case a neighborhood dog or coyote is on the loose. If for some reason you can’t install 6′ perimeter fencing, you’ll instead want to make sure your flock has a large, secure run to spend their days in. 2. Bury 1-2′ of hardware cloth on the outside of your fence. If you’re gone all day at work, that leaves plenty of time for a canine to dig under your 6′ tall fence. What to do? make sure the bottom of your fence is either buried or strongly secured to the ground so an animal can’t push underneath it. bury 1-2′ feet of hardware cloth immediately next to your fence on the OUTSIDE of your fence. When an animal tries to dig under, they’ll soon hit the hardware cloth and won’t be able to dig further. Yes, you can grow grass on top to hide the wire. 3. Block gaps and holes in your fence. Even though we have a 6′ tall fence, apparently the contractor who installed it before we moved into our house wasn’t great at the job. There’s an 8″ gap where the wood fence meets the chainlink fence – plenty of room for a small predator to sneak in. It’s not the most beautiful thing in the world, but that gap is now blocked by hardware cloth. 4. 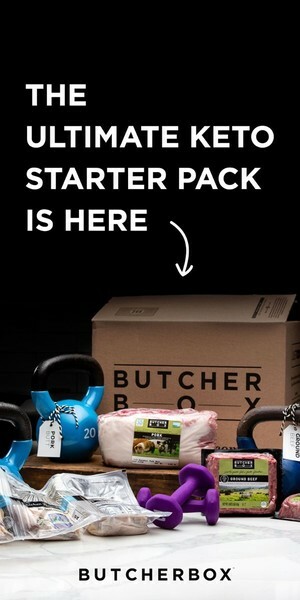 Don’t skimp out on your coop. It should go without saying, but if you’re going to have backyard poultry, you have a responsibility to build them a strong, sturdy coop. Since most predators hunt at night (when your ducks or chickens are in their coop), your coop is your primary line of defense against predators. you check off the additional chicken/duck coop safety measures listed below. Cheap out on your coop up front, and you’ll end up paying for it later. The maiden voyage of the Quacker Box, our first duck coop. The wheels detach, allowing it to lay flat on the ground. 5. Use 1/2″ or smaller wire mesh on your coop’s exterior. Raccoons are REALLY good/dangerous with their hands and they’re one of the biggest predators of backyard ducks and chickens. If the wire caging on your duck or chicken coop is too large, raccoons will be able to reach right in and grab your poultry. To prevent this from happening, use 1/2″ – 1/4″ wire mesh on any open areas of your coop. This also prevents snakes from crawling in as well. No predator can reach or crawl in through 1/2″ wire mesh. Do NOT use chicken wire. 6. Bury 1/2″ – 1/4″ wire mesh underneath your coop. Critters large and small can dig under and into your duck or chicken coop. In fact, we’ve heard horror stories of rats tunneling into coops and killing poultry. To prevent anything from digging or burrowing under and into your coop, place the coop on top of a 1/2″ – 1/4″ wire mesh. (Assuming you don’t have a solid-floor coop.) 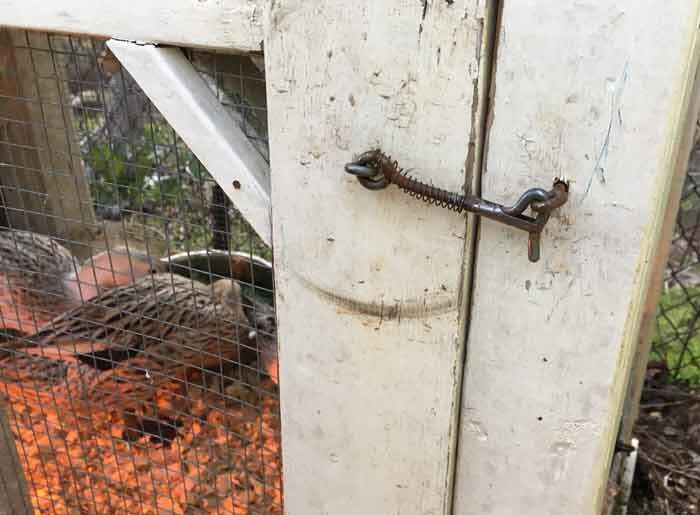 Ideally, you can make sure the wire mesh sticks out about 8″ on all sides of the coop to help discourage larger predators from trying to dig under as well. *We use pine shavings on top of the wire mesh inside our duck house so their feet aren’t scraped or damaged by rubbing against the wire. 7. Use safety latch eye and hook locks on your coop doors/windows. Remember what we said about raccoons being good with their hands? Well, they can figure out how to open a simple latch if it’s just a matter of pulling it open. That’s why you need to use safety latch eye and hook locks (like these) to prevent raccoons from opening your coop’s doors or windows. The spring-lock feature means humans are the only ones that can open the lock. We have one of these locks on the top and bottom of both our duck coop doors. 8. Construct tight openings around coop doors & windows. Snakes can flatten themselves down to unbelievably small sizes and raccoons can reach their hands into small spaces as well. Snug as a bug on a rug. This is the door of the Quacker Box, our duck coop. Notice there’s almost no gap on the door, which keeps snakes and the hands of predators out. When your coop is closed up, there shouldn’t be any gaps larger than 1/2″ anywhere on your coop. 9. Remove eggs in morning and close your coop door during the day. Get in the routine of removing the eggs from your coop first thing in the morning when you let your flock out. Eggs left in the coop are an invitation to rats, snakes, and other predators. Also, once your flock is out and the eggs are removed, take out any food bowls AND close the coop back up. 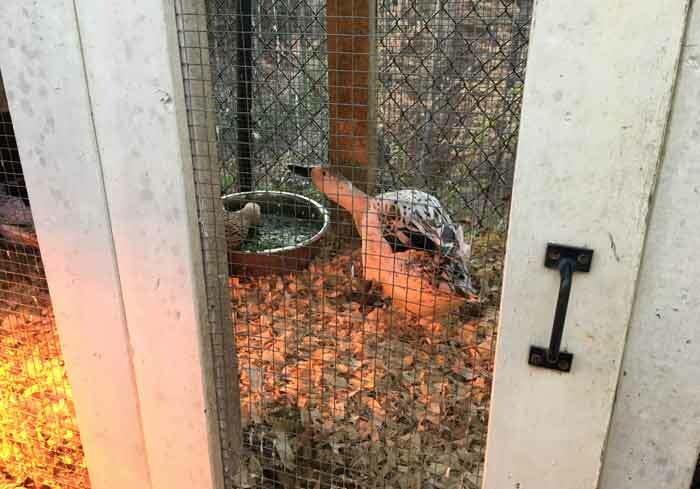 Snakes can’t come into a closed coop if it’s properly constructed, and you probably don’t want to have to remove a trapped snake by hand in the evening when you’re trying to put your flock up for the night. The exception to this rule is if you have a coop attached to a run, and the coop is the only place for your poultry to seek shelter during the day. 10. Don’t put your flock out until an hour after dawn. Most predators hunt from dusk until dawn, especially in more urban areas. If possible, don’t let your ducks or chickens out of their coop until an hour after dawn. 11. Put your flock up at least 30 minutes before dusk. Similar to #10, put your ducks or chickens in their coop at least 30 minutes before dark unless you’re with them. Many nights when we have our ducks outside with us, we’ll enjoy a nice sunset together rather than following this rule. Birds of prey, primarily larger hawk species, are another top killer of chickens and ducks. Our girls are in a fairly large fenced in back yard all day, and have never been attacked by a hawk. Why? Our best guess is that when hawks are hunting, they generally like a clear “runway” to their prey, which is one reason they tend to hunt in open fields. 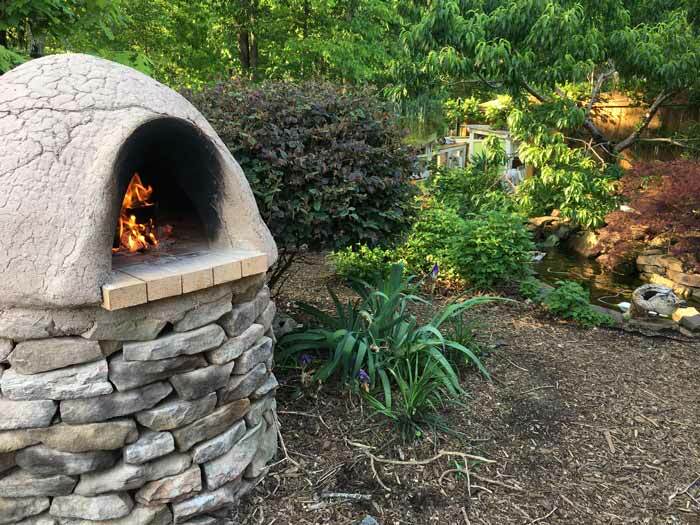 In addition to our tall fencing, our back yard has a giant oak tree, a large persimmon and peach tree, blueberry and other bushes, a cob oven, and several large rocking chairs. Our back yard in summer during a cob oven cook. You can see our ducks swimming in their pond in the background underneath a large peach tree. Behind that, you can make out part of the 6′ tall wood fence. In short, it would be virtually impossible for a hawk to fly in using their preferred hunting approach. If this step isn’t possible for you, cover your duck or chicken run with hardware cloth. Ever watch nature documentaries? Notice that the prey animals that tend to get picked off by the large predators are isolated and/or separated from the herd. Don’t ever just have a single duck or chicken. For one, these are highly social flock organisms that thrive when they’re around others of their species. Second, a bird of prey is much more likely to attack if you only have 1-2 chickens or ducks. Attacking a larger flock = higher risk in a hawk brain. Better to go hunt mice or rabbits in a nearby field. Bob the cat is a voracious hunter of rodents. He used to be a voracious hunter of songbirds until we figured out how to put a stop to that. However, through exposure and training during his early years, Bob knows that ducks are NOT to be messed with. 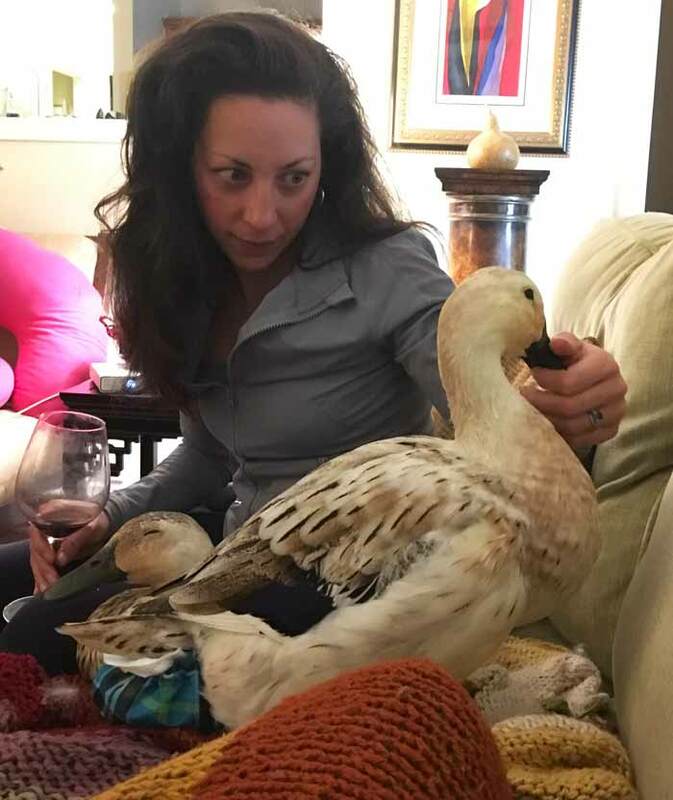 In fact, our adult ducks will occasionally beat Bob up, and he won’t even raise a paw in defense. He simply runs away instead, which we reward with treats and petting. 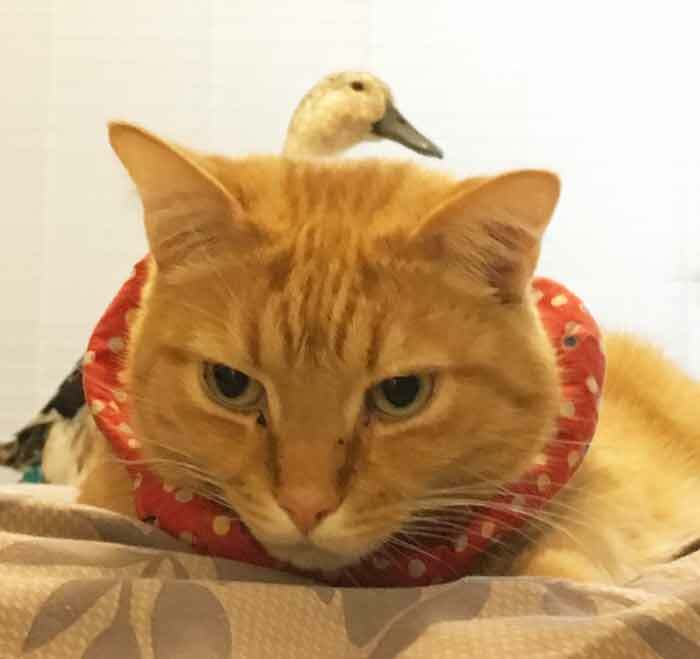 Bob the cat sporting one of his birds-be-safe collars. Bob is convinced that somewhere, somehow a duck is always looking at him, a condition known as anatidaephobia. We tell him he’s just being paranoid. As a predator, Bob (and his scent) help to keep other predators out of our yard. 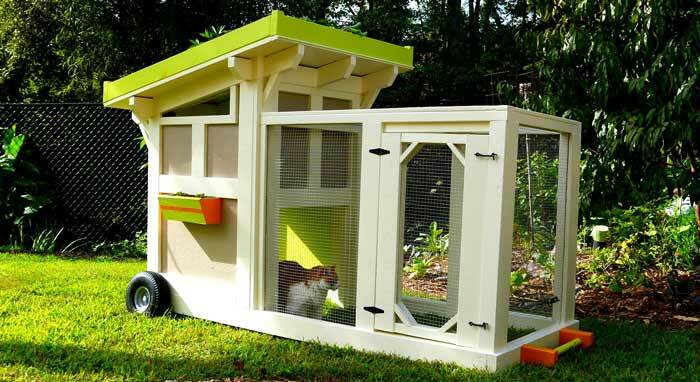 You can also train cats and dogs not to harm your poultry while providing your flock with additional protection. 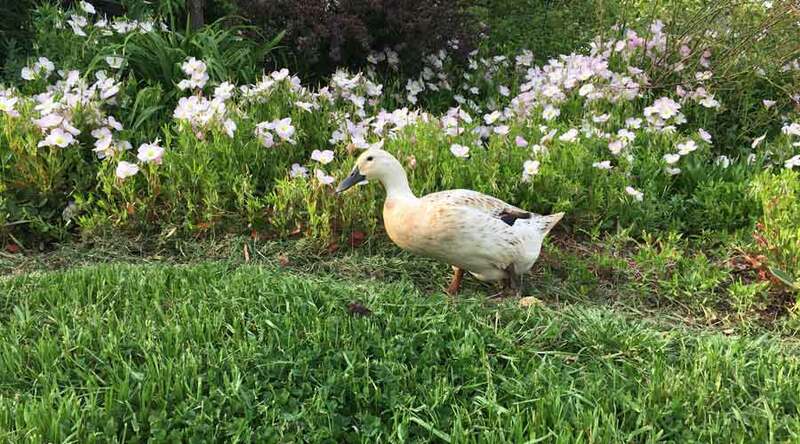 Keep in mind that this is a potentially risky measure since an untrained cat or dog can just as easily be a predator for your ducks or chickens. Use extreme caution if you have or plan to use a guard animal for your backyard poultry. 15. Don’t leave poultry food out at night. 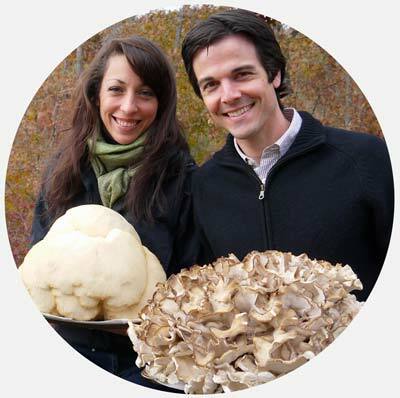 Another good habit to establish: take the food out of your coop in the day and put it back in the coop at night. Don’t leave duck or chicken food laying out in your yard at night. 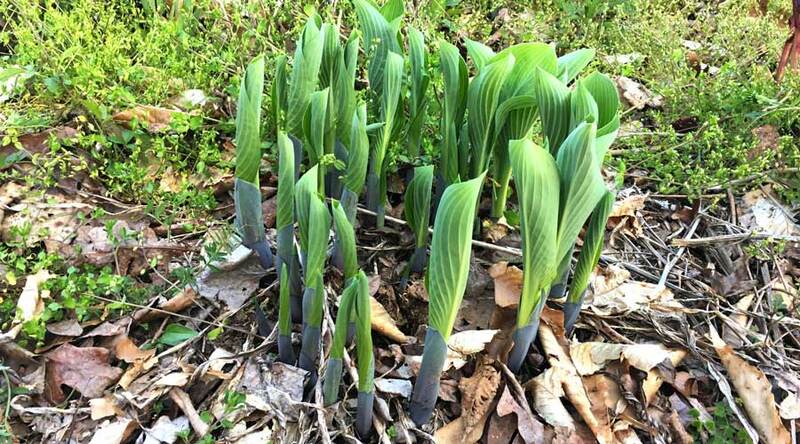 Leaving food out attracts skunks, raccoons, vermin, and other pests that will start thinking of your yard as a great place to get free food and raise their young. 16. Regularly mark your territory. Mark well and mark often, fellas. You now have a legitimate reason you can use to tell your wives/partners that you in fact have to pee outside. You have a duty and a responsibility to do so. Women, you’re welcome to join in on the territory-marking activities as well. You’ll just need to proceed with more caution. Added benefit: your urine is a great fertilizer for those back yard fruit trees/bushes that also help protect your poultry from hawks (#12). 17. Always check your coop before putting poultry up at night. You know those scary movies where you’re screaming “don’t go inside” at the screen because you know the monster-zombie-thing is in there waiting? We’ve heard of similar stories with raccoons hiding inside coops that didn’t have a happy ending either. One summer night as I was preparing our Quacker Box for the evening, I looked in the back and noticed a large black snake inside. 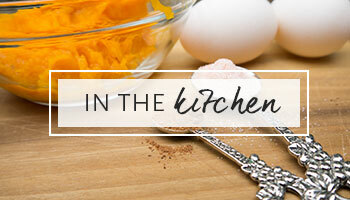 Yep, I’d neglected to close the coop door (tip #9). Every night since, I always take a look inside the coop to make sure other unwanted critters aren’t in the coop before our ducks are put up. One way I make sure to do this is by topping up the pine shaving bedding at night, rather than in the morning. 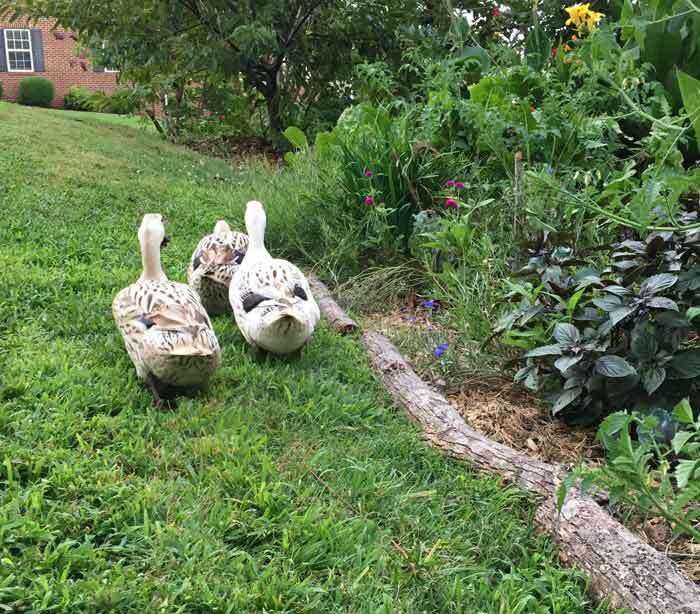 Don’t think you can follow these precautions to keep your backyard ducks or chickens safe from predators? Then we’d strongly encourage you not to get ducks or chickens. We’re not trying to be mean or snotty, we’re just trying to prevent unnecessarily terrible outcomes for you and your potential flock members. 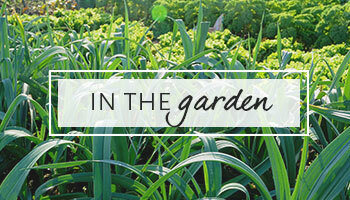 Want to get back yard ducks or chickens? 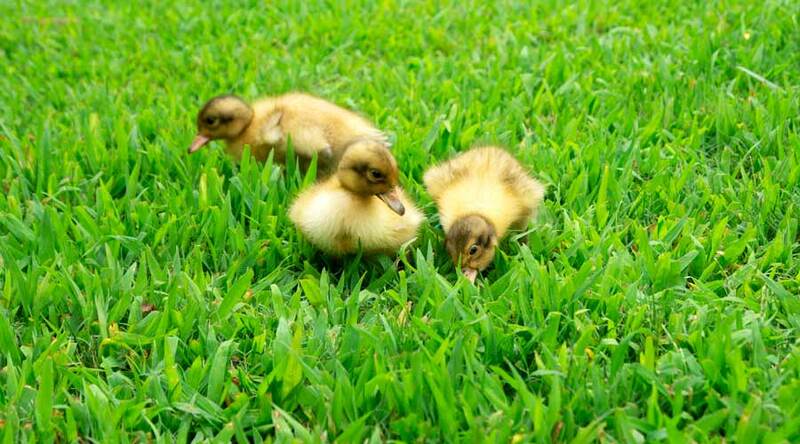 First get your ducks in a row by making sure you have safety measures in place to protect them against predators. If not, please delay or opt not to be poultry parents. If you don’t take steps necessary to keep your backyard poultry safe, you’re much more likely to end up with dead or severely injured birds, expensive vet bills, or animals that have to be euthanized. To us, it seems like a better idea to either do things right or not do them at all. 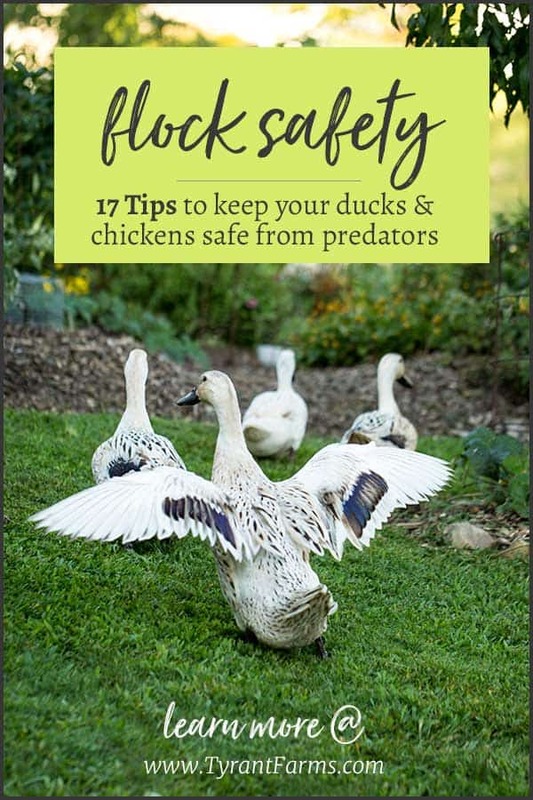 If you currently have (or decide to get) backyard chickens or ducks, we hope these 17 tips to keep your poultry safe from predators were helpful!